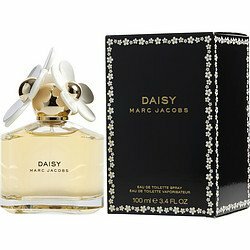 Launched by the design house of Marc Jacobs in 2007, MARC JACOBS DAISY is a women's fragrance that possesses a blend of Grapefruit, Musk, Vanilla, Wood, Jasmine, StrawberryWhen applying any fragrance please consider that there are several factors which can affect the natural smell of your skin and, in turn, the way a scent smells on you. For instance, your mood, stress level, age, body chemistry, diet, and current medications may all alter the scents you wear. Similarly, factor such as dry or oily skin can even affect the amount of time a fragrance will last after being applied. If you have any questions about this product by Marc Jacobs, contact us by completing and submitting the form below. If you are looking for a specif part number, please include it with your message. MARC JACOBS Daisy Love Eau de Toilette Spray, 3.4 Fl Oz. Armani Code By Giorgio Armani For Men. Eau De Toilette Spray 4.2 Oz.